Tear Film LIPIDS are of utmost Importance for the Function of the TEAR FILM and thus for the Ocular Surface as a whole. The MEIBOMIAN GLANDS inside the eye lids produce lipids. The Meibomian Lipids form an OIL at body temperature. 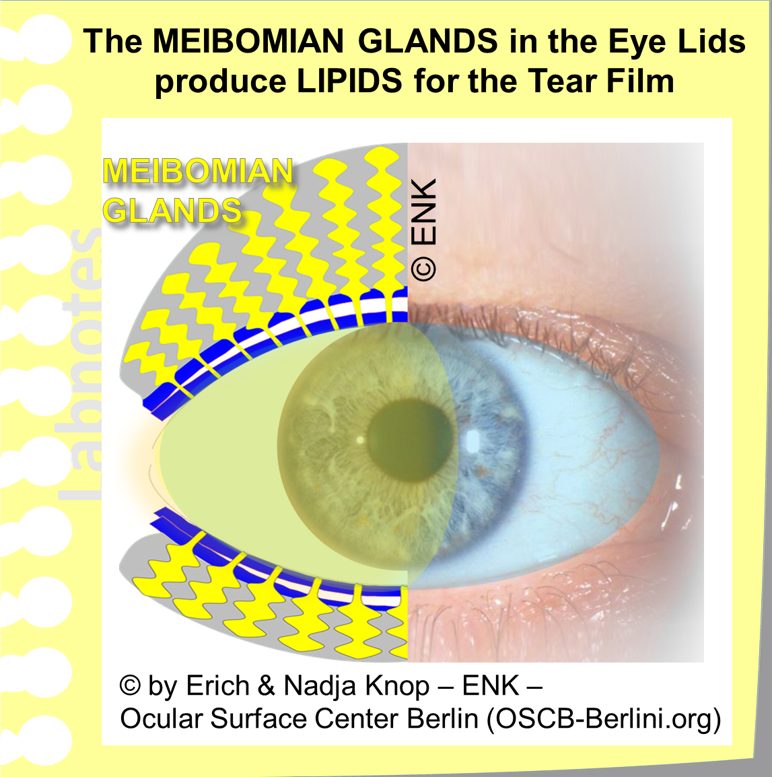 The Meibomian Oil forms the superficial phase of the tear FILM - The tear FILM LIPID LAYER (TFLL). The Meibomian OIL in the Tear Film has important functions for the STABILITY of the Tear Film. Meibomian oil RETARDS the EVAPORATION of the aqueous phase. Meibomian OIL provides a HOMOGENEOUS and perfectly SMOOTH SURFACE for the Tear FILM for perfect light refraction and visual acuity. The lipid production for the tear film is achieved by a large number of individual Meibomian glands. Every single Meibomian Gland has its own orifice. Meibomian Glands have some structural characteristics in contrast to other sebaceous glands such as a long slender gland body. Therefore, SECRETION and DELIVERY of the oil occur in separate regions in Meibomian Glands. SECRETION is the production of the oil deep down inside the Glands. DELIVERY on the other ´end´ describes the process of driving out or delivering the oil from the orifice onto the lid margin. The Differentiation between SECRETION and Delivery explains Obstruction as a main pathology of the Meibomian Glands. Tear Film LIPIDS are of utmost Importance for the Function of the TEAR FILM and thus for the Ocular Surface as a whole. The Meibomian glands are lipid producing sebaceous glands in the eye lids. The lipids are very important for the homeostasis of the tear film and for vision. The TEAR FILM LIPID LAYER is the outer surface of the tear film, it improves tear film stability through retarding the evaporation of the aqueous main phase and provides a smooth homogeneous surface for refraction of incoming light. Due to the important functions of the Meibomian Lipids for the TEAR FILM ... and since the tear film is the most important requirement for health and integrity of the Ocular Surface ... it is no surprise, that Meibomian Gland Dysfunction (MGD) is the main cause for Dry Eye Disease. The Meibomian glands are located inside the tarsal plates of both the upper and lower eye lids. They produce lipids that are liquid at body temperature and thus form an OIL. Healthy Meibomian Glands deliver a clear liquid oil (arrow) through their orifice onto the lid margin. This can be tested by a technique termed ´Diagnostic Expression´ with very mild pressure from the outside - every orifice should then deliver a little puddle of oil (arrow). 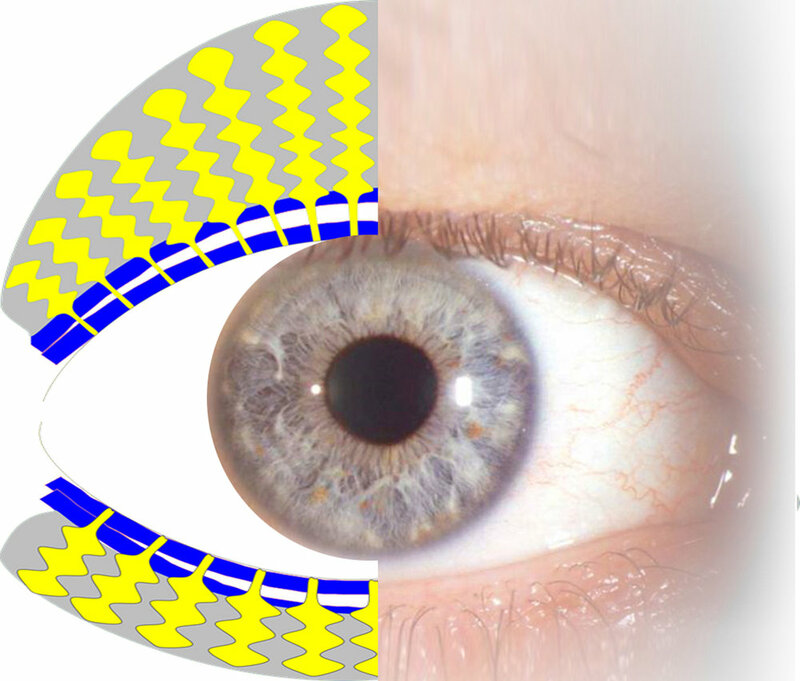 The Tear Film in front of the transparent cornea (the pre-corneal tear film) is a layered structure in which typically three layers are discriminated: (1) at the outside surface to the ambient air is, as just explained in the text to the left, the thin layer of Meibomian Oil (yellow). The oil covers (2) the aqueous main phase of the tear film that is conceivably to some extent mixed with Mucins that constitute in a concentrated for the (3) inner Mucin (pink) Layer that is locate directly on and produced by the cells of the surface epithelium of the ocular surface. The thin lipid layer on top is in the schematic drawing shown much too broad - because, in the real size relation, it would be almost impossible to see it in cross section through a tear film. The main functions, among probably many others, are the retardation of evaporation of the aqueous phase, the water of the tear film, by sealing the tear film like a lid on a pot of warm water. A second important function is to provide a very smooth and homogeneous surface for the air-to-tear interface that is the main refractory surface of the eye. It provides about 3/4 of the refractive power of the eye. ... WHY ARE THEY CALLED GLANDS IN THE PLURAL FORM ? The extended long gland bodies of the MEIBOMIAN GLANDS can be seen through the conjunctiva when the eye lid (here the lower one) is slightly everted. The individual orifices (indicated here by open arrows) are typically arranged in a single row, very close to the posterior lid border - immediately in front of the anterior rim of the tear meniscus. Other sebaceous glands are typically associated with hairs, as e.g. all the hairs in the skin have associated sebaceous glands. Sebaceous glands, particularly those in the skin, are typically short and stout with a short excretory duct that delivers the produced oil into the hair follicle around the hair shaft and onto the skin. acini are filled by secretory cells termed Meibocytes. and the main therapeutic challenge is the removal of obstruction in order to get the lipid secretion flowing again. WHAT IS a SEBACEOUS GLAND ? Secretion and Delivery of the Meibomian Glands - what is that ? Due to the explained long extension of the Meibomian glands the secretory Meibocytes in the spherical acini are typically far away from the orifice at the posterior lid margin. In an obstructed gland (right) the delivery of the secreted oil is blocked and therefore the increasing pressure inside the gland leads to a dilatation of the ducts and to a pressure atrophy of the secretory acini. The Differentiation between SECRETION deep down in the Gland that fills the ductal system with oil and the eventual DELIVERY from the ductal system out of the gland onto the lid margin allows to better understand obstructive MGD. Obstruction of the terminal part of a Meibomian Gland will necessarily lead to a stasis of Meibomian oil inside the gland and, since the secretion in the acini continues, the pressure inside the gland will increase. This will necessarily lead to the potential onset of pressure-dependent atrophy of the gland with dilatation of the ducts and destruction of the secretory tissue.